Recordings are available in a timely manner. Allow live broadcast as an add-on feature. Avoid tiresome and repetitive low-fun work. Avoid backlog and simplify management of recording, especially for multiple tracks over several days. Have more fun while working. For comparison, please also check our pointers to alternate setups. Rundown of needed gear for the 2012 setup. This takes into account the slides presentation and allows us to do picture in picture. I.e. make the speaker visible in small, while showing the slides in full. We ressort to a) existing Hardware owned by SUSE, b) existing Hardware privatly owned. c) New equipment bought through both openSUSE and SUSE cost centers. We plan to eliminate the use of b) later in 2012, through c). Access to the storage rooms needs to be planned. Please contact Christopher for the keys. A small desk with LAN and power, where Laptop operators can work. A safe place for the main Camera tripod. Audio Mixer with Compressor BEHRINGER XENYX 1204, with headphones & cables. Portable USB Harddisks for moving recordings around. An HDMI to VGA converter to help presenters with Tablet-PCs. One VGA adapter for iBooks. One cheap XLR Cable Microphone, just in case. See Juergen's dvswitch_cheatsheet for a quick tutorial. See Juergen's HOWTO for using a twinpact 100. See Juergen's dvsource-alien_howto for using non-firewire devices with dvswitch. See upstream component description . Depending on experience, these roles can be merged into fewer persons. from now on. Please also subscribe there for video notifications. This reduces ca. 6GB per hour to ca. 100MB per hour. The description below assumes the old setup, from 2011 and earlier, where we are rewinding tapes and spending hours in post production. It is here only for reference. 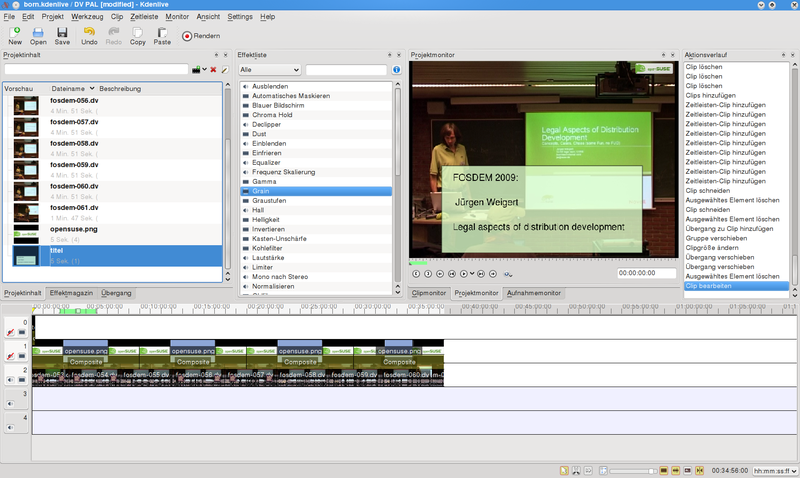 With version 0.7.8 of kdenlive we found our tool of choice to create the openSUSE videos. Grab it from Packman (1-click). You can download the template we use to create the talk recordings with the openSUSE logo in the upper right corner and a startscreen that displays the topic. See https://en.opensuse.org/openSUSE:Video_Recording/Notice_Template for instructions how to properly announce recordings. In general we asume all our presentations are public. We welcome external guests, both as speakers and audience. Recordings or live video feeds are shared with our community and the public in general unless there is reason not to do so. If you (as speaker or audience) want to restrict distribution, please let us know before the presentation . Public recordings are listed on http://www.youtube.com/user/opensusetv while others are accessible only with a direct link. If you announce a presentation, please also make sure that video recording is mentioned in the announcement, and clearly say if it is wanted for public, or for internal audience only. We understand that the copyright remains with the authors, with the production team and supporting companies potentially acting as contributing authors. Unless exceptions are mentioned, we distribute our footage under CC-BY-3.0 license. Feel free to suggest a dual license model if needed. The video server streaming.nue.suse.com is hosting both, recordings and live streaming for SUSE internal material. All videos (done by the openSUSE Video Team) are uploaded here, including those that are also on youtube and elsewhere. http://bambuser.com/channel/opensusetv is great for providing live streams. Since September 27, 2013 they moved the live video service away from the free account and into the premium account. Opensuse got an exception: bambuser support recognizes our work as valuable for the community, and hey happily enabled live streaming for us. Thank you bambuser! The magic credentials for this are owned by Jürgen Weigert <jnweiger@gmail.com> . With ffmpeg we can connect to streaming sites that accept the FMLE (Flash Media Live Encoder) protocol - also known as RTMP. Bambuser.com -- no more RTMP since 2013-09-27. Live streaming from a V4l2 device is possible with a flash based browser plugin. ustream.tv -- Ustream Producer software is available for Mac and Windows. Linux evaluation pending. Live streaming from a V4l2 device is possible with a flash based browser plugin. The account juergenweigert9 with channel opensusetv is a free trial of pro broadcasting. Trial period ends 2013-11-19. According to heise, we need min. 100 subscribers for youtube to allow live. user news@opensuse.org, channel opensusetv has over 1100 subscribers. http://www.youtube.com/account_features -> Live-Veranstaltungen [Aktivieren] Requires a mobile phone number, for an SMS or voice activation code. -> Select 'Live Veranstaltung' from the left hand menue. Please add talks to the openSUSE:Tube page, for conferences we have dedicated pages, such as Fosdem 2008, Fosdem 2009. Syntax see: Adding Videos to openSUSE wiki. CLEANUP: This no longer exists??? Andrew Wafaa started a dedicated openSUSE channel on opensuse.blip.tv. Ask FunkyPenguin or digitltom in irc to get files published there. Files from blip.tv were automatically pushed to our youtube channel. As of 2013 this forwarding service is no longer available. If you can follow these link from outside of suse, let us know. If you find a video there, that can go public, let us know too. Dvswitch can be used to record and simultaneously forward the image to the big flatscreen outside. there is a delay of ca 1-2 seconds between the original presentation and the the flatscreen. We placed long cables and extra speakers as the planned audio setup of the rooms is undocumented. eliminate the video delay on the flatscreen, by a direct cable from the EBC VGA switch matrix. eliminate the need for extra speakers by interconnecting the audio systems of both rooms. The seating area has speakers and an amplifier. provide holes in the wall for running cables between EBC, server room, seating area, museum area. This page was last modified on 11 May 2015, at 13:42. This page has been accessed 27,595 times.